See more objects with the tag collectors, public, advertising, print collectors, shields, coat of arms, leaves, death, laurel leaves, papal cap, torches, coffin, grave, skulls. See more objects with the color darkkhaki bisque darkolivegreen darkslategrey dimgrey or see all the colors for this object. This and 25 other objects are a part of a set whose first object is Album, Second recueil et troisième livre de cartouches (Second Album and Third Book of Cartouches). This is a Print. It is dated 1740 and we acquired it in 1921. Its medium is engraving on white laid paper. It is a part of the Drawings, Prints, and Graphic Design department. 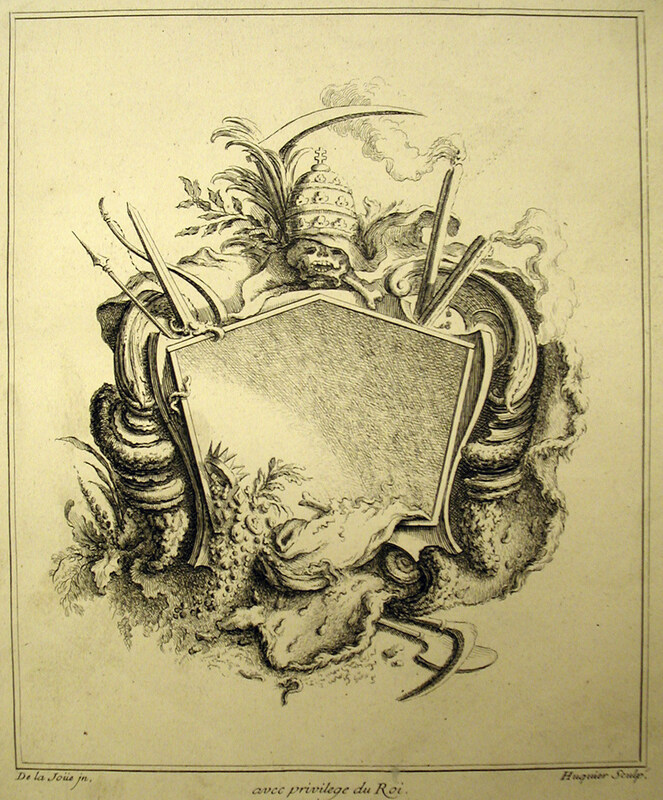 This cartouche design by the French academician, painter, and ornament designer Jacques de Lajoüe was etched by printmaker and publisher, Gabriel Huquier, for his Second book of Cartouches (ca. 1734). The composition combines a symmetrical pentagonal cartouche with an elaborate combination of emblems and motifs. At the apex of the pentagon is a skull wearing the Triregnum, the three-crown papal tiara topped here, unusually, with a patriarchal cross. Accompanying the crowned skull are laurel leaves, a scythe, smoking torches, a sword, a spear, and a bow. Flanking the sides of the cartouche is grotesquely amplified shell-like scrolls and fossilized foliage. At the lower edge are loose antique coins, a crown, reeds and a spade and a pick. Together, they convey the ambience of an archeological site or a graveyard. Such fantastical designs were not intended to be realized but were a popular format upon which artists explored the limits of the rococo style. 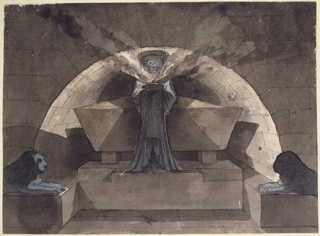 Lajoüe was a prolific designer whose prints were in great demand by connoisseurs. This design is a paradigm of the rococo style where unconventional emblems culled from zoology, botany, and even papal emblems were collaged together in service of ornament. This object was featured in our Object of the Day series in a post titled A Papal Graveyard. On plate, upper left: B; upper right: 4; lower left: De la Joüe in. ; lower center: avec privilege du Roi. ; lower right: Huquier Sculp.